Modern day vehicles are fitted with disc brakes at the front and drum brakes at the rear, although it is becoming more common for disc brakes to be also fitted at the rear. Three most common problems include a grinding noise when the brake pedal is applied. This is usually caused by the brake and pad friction surface wearing down to the metal to metal contact to the brake disc. 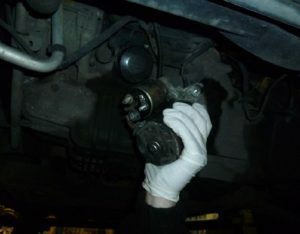 • Brake Judder – This happens when the brake pedal is applied and the steering wheel judders. This is usually caused by the distortion of the brake disc. • Spongy brake pedal -When the footbrake is applied there is little resistance and the pedal sinks down to the floor. • Hydraulic leak or worn brake linings – It should be noted that in our experience brake disc wear occurs far more commonly than it used to due to the absence of asbestos since its removal for health and safety concerns.This makes for a far harder lining on the pad that causes more premature wear to the disc. 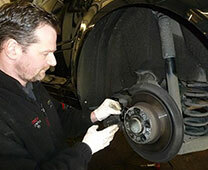 We provide a free visual inspection of your car’s brakes and will only carry out any work with your prior approval. If you need to replace your car starter motor then we have a range of starter motors available for all makes and models. Please ring for a quote.